Design this heart blanket with a photo in a heart shape for someone special. Create and personalise it online and see before you buy. Celebrate love with someone and give them this high-quality custom heart blanket. Double layer of 285 gsm non-fray Polar Fleece, made by hand by Bags of Love with over thirteen years of experience. With a choice of three front side designs and three sizes as well as six different backing colours, add your photo to this personalised heart blanket for a truly unique gift. Personalised heart blankets with photo in a heart shape make a gift of love. Perfect gift idea for Valentine's Day or for any special day when you want to show the love of your life how much they mean to you. And when they open this Love Blanket gift of love, they will love the quality and the print and they will just want to cuddle it. Make a personalised heart blanket today in your choice of three sizes. The small size is perfect for a single bed whereas the large is ideal for a king size. If you want some blanket to drape over the side of your bed then order a size bigger. Also ideal for use on sofas and even for outdoor benches. We print the love blanket's fleece and then we sew it together with a backing colour that you can choose for the highest quality finish for your blanket of love. It's a handcrafted beautifully printed custom love blanket made here in the UK by Bags of Love. The heart blanket is made and sent same day and comes with a 10-year guarantee on print & material. Buying presents for our other halves is a very difficult exercise. It is so hard to think of the perfect present because we really want to get them something truly extraordinary to let them know how much we love them. The love blanket is wide and spacious and will be placed in the bedroom or the living room as a beautiful cover to keep you warm and dry. 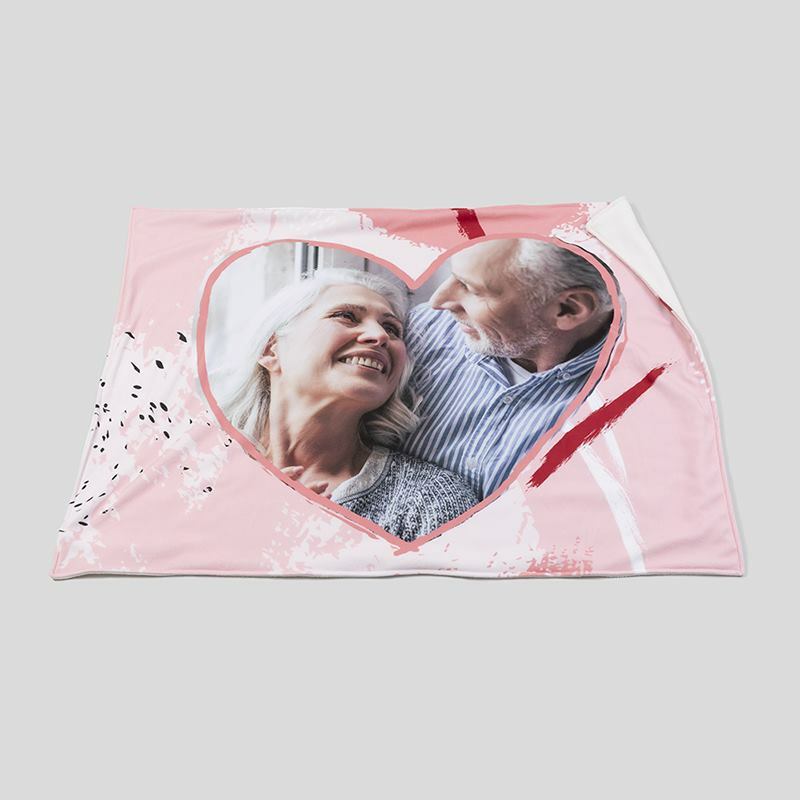 Wedding photos, anniversary photos, or even an old snap of your first date could be the perfect subject for the blanket. The item itself is rectangular, but the photo is heart-shaped and surrounded by a choice of three romantic patterns. Care: Anti pil fleece blanket machine washable. Recommended 30 degrees C, tumble dry low temperature. Your photo and the design of the blanket of love is printed by our technicians onto the polar fleece. They use a digital printing method that infuses the eco-friendly inks deep into the fibres of the material. This gives a long lasting, beautiful print that will last for years. Our craftsmen then cut your heart blankets to size and shape before our seamstresses hem them. Everything is lovingly made to order by hand, here in our London studios. When you design your own blanket of love, you can even add text if you wish for a beautiful addition to your personalised present. Express your love in a novel way and break the mould – too many of us give unadventurous gifts that simply tick the box for a special occasion. Get your other half something he or she will absolutely love with a blanket of love that you design online just for them. Handmade gifts from Bags Of Love bespoke to your specifications and suggestions. Design your own camping blanket with your photos or designs, for extra warmth on those breezy campsite nights. Made in the UK.